Participants are invited to join local collective Living Proof for a two day screen-printing workshop in mid-late November. We will cover how to prepare and print a 2 color screen-print for paper 11×17 inches or smaller. Ideal for art prints, flyers, promo materials, and general 2-color experience. Participants will gain first hand experience working with image editing software, preparing and burning screens, registration, printing, paper handling, and clean-up while working in our DIY studio. All materials (imaging software, screens, emulsion, inks, paper) covered. Participants will bring their own image to print, following the advised guidelines provided. Participants will make 13 prints to keep and 7 prints that will be traded with the shop and other participants, but are welcome to bring or purchase additional paper if they’d like additional prints. Participants should come with prepared drawings/files (saved to e-mail/ubs drive) that are appropriate for 2-color (layer) paper printing 11×17 in. or smaller. Participants are free to bring along their own paper, or use paper provided. The first days class will be a full morning and afternoon and include time for preparing images at the the living proof shop, Boxed Lunch or Lunch at the Global Market around 1ish, a studio tour, and screen prep. Feel free to bring coffee/drinks/snacks with you. We were originally planning to meet at the library but alternatively have computer work stations set up at the shop to use to cut down on transportation time and the learning curve with new equipment. We will have Photoshop and Gimp available for last minute edits to images. The second Day will be printing only, where you’ll be working in partners to complete your editions. As a bonus, participants who finish the class and enjoy using the Print space are eligible to attend Open Shops at the Living Proof studio which is a semi-regular open studio time for our past exco participants. It is likely that we will end early on Sunday, so be prepared for that. Some of you may finish before others. 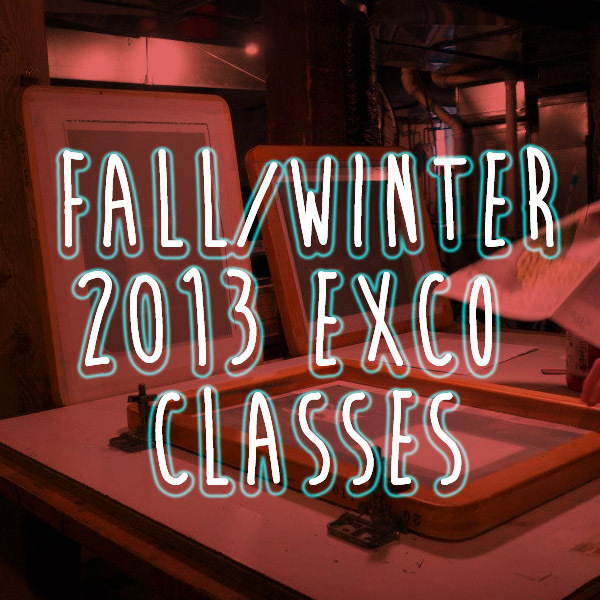 We have been offering beginning classes since fall 2011. 6 – To participate you must be registered through Exco’s website and be confirmed to attend via Facilitator. Venga y aprende con nosotros: serigrafia! Aprendera disenar y realizar imagenes que se realizan por medio de serigrafia. La serigrafia es un arte que le puede ayudar a promocionar y compartir sus propios imagenes. Enfoquemos en tecnicas y artes que se puede hacer caseras, y compartir con sus comunidades. Tratamos de los basicos del estudio, materiales, tintos y procesos de imprimir. En nuestro taller, usted tendra la oportunidad de hacer sus propias serigrafias en papel o en tela que se puede compartir con los demas. Dia 1 se trata de disenar y preparar los imagenes para imprimir. Dia 2 se trata de exponer y imprimir los imagenes. Debido a limitaciones del estudio, solo se permite 5 participantes en cada taller. Por favor matricula solo si este segur@ de que pueda asistir los dos dias. Les mandamos un email con mas informacion una semana antes del taller. This will be our seventh session facilitating workshops with Exco. Living Proof has led classes for ages elementary to adult and believes that printmaking can be a tool for spreading messages, sharing stories, and speaking truth. ← OPEN SHOPS ARE BACK!